“Both the U.S. Nuclear Regulatory Commission and the STP operator have previously recognized a credible threat of a severe accident initiated by a breach of the embankment wall that surrounds the 7,000-acre reactor cooling water reservoir,” said Paul Gunter, director of the Beyond Nuclear’s Reactor Oversight Project, in a statement by the coalition on Tuesday. With the nearby Colorado River already cresting at extremely high levels and flowing at 70 times the normal rate, Karen Hadden, director of SEED Coalition, warned that the continue rainfall might create flooding that could reach the reactors. 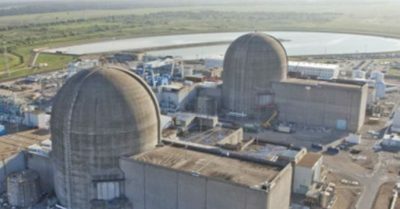 Susan Dancer, president of the South Texas Association for Responsible Energy, said that as residents in Bay City—herself included—were being forced to leave their homes under mandatory evacuation orders, it makes no sense to keep the nuclear plant online.